We welcome enquiries for new 10/11 week terms. If you are interested in enquiring for the Summer term, which begins in April/May 2019, please forward your details via the booking page and we will add you to our reserve lists. Evening classes at Wobage run on Monday, Tuesday, Wednesday and Thursday evenings, between 6.45 and 9.15pm, for three ten or eleven week blocks per annum. These termly courses, predominantly in thrown ceramics are suitable for beginners, intermediate and advanced makers. Numbers are limited to a maximum of 9 students to ensure sufficient one to one tuition and a power-wheel for each participant. 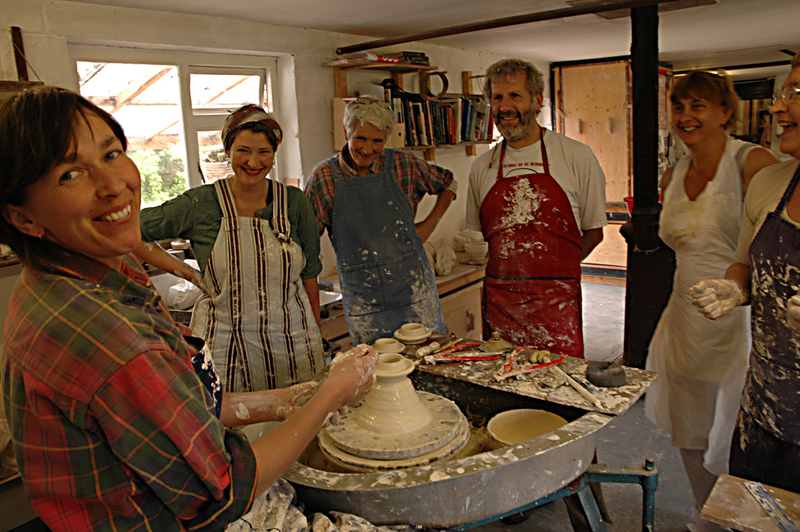 The focus of the classes is with the development of wheel-thrown work, along with other related skills such as clay preparation, turning, handling, slip-decoration and raw-glazing. On Tuesday and Thursday evenings, Jeremy’s students make with stoneware, salt-slips and raw-glaze. Students will be invited to make a selection of approximately a dozen of their best pots which they will wood-fire and salt-glaze. On Mondays and Wednesdays, Patia’s students make slip-decorated earthenware. Reservations for a 10 or 11 week term are made with a £50 deposit, the remaining balance of £145, or for Tues/Thurs. £170 is payable on the first evening of term. A charge will be made in addition to the course fee to cover the cost of fired pots. For wood-salt fired pots (Tues/Thurs) this is £3.50lb. Once you have joined a course, students are offered priority of place for the following term should they wish to continue. weeks 10 & 11 – Feb’/March 2019, a Saturday to be confirmed, student wood salt-firing of the ‘Phoenix’ kiln. The throwing studio will be open as usual, daytime and evening, for making inbetween student stoking shifts. weeks 10 & 11 – March/April 2019, a Saturday to be confirmed, student wood salt-firing of the ‘Phoenix’ kiln. The throwing studio will be open as usual, daytime and evening, for making inbetween student stoking shifts. weeks 10 & 11 – May/June 2019, a Saturday to be confirmed, student wood salt-firing of the ‘Phoenix’ kiln. The throwing studio will be open as usual, daytime and evening, for making inbetween student stoking shifts. weeks 10 & 11 – October/November 2019, a Saturday to be confirmed, student wood salt-firing of the ‘Phoenix’ kiln. The throwing studio will be open as usual, daytime and evening, for making inbetween student stoking shifts. weeks 10 & 11 – Feb’/March 2020, a Saturday to be confirmed, student wood salt-firing of the ‘Phoenix’ kiln. The throwing studio will be open as usual, daytime and evening, for making inbetween student stoking shifts.